Marani’s mighty meat and mushroom khachapuri. Living in Queens, arguably the most diverse food destination in the world has made me conversant, if not expert, in global cuisines ranging from Thai and Indonesian to Mexican and Peruvian, to name a very few. The Arch Electric dwarfs Ben’s overstuffed pastrami sandwich. “Does anybody ever order these?” I asked the waitress at my local deli as I pointed to the list of novelty sandwiches with names like Dr. Ruth Westheimer (brisket of beef, turkey, lettuce, tomato, and Russian dressing) and the New York Newsday (salami, tongue, corned beef, and cole slaw). “Sure, all the time,” she said. By local deli I refer not to a bodega trafficking in bacon and cheese sandwiches but Ben’s Best, a bona fide Jewish deli with a 70-year history lovingly maintained by Jay Parker and his crew. Latke and matzo ball soup, together at last! “I don’t even come here for knishes any more,” a gentleman I shared a table with at Knish Nosh said to me yesterday. “I come for her cooking,” he said of Chef Ana Vasilescu, who makes killer perogies among other specialties. I had come for a bowl of matzo ball soup. 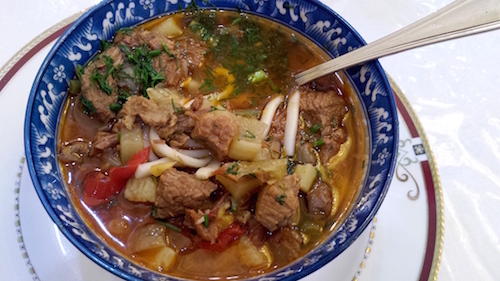 The Central Asian cousin of Taiwanese beef noodle soup.